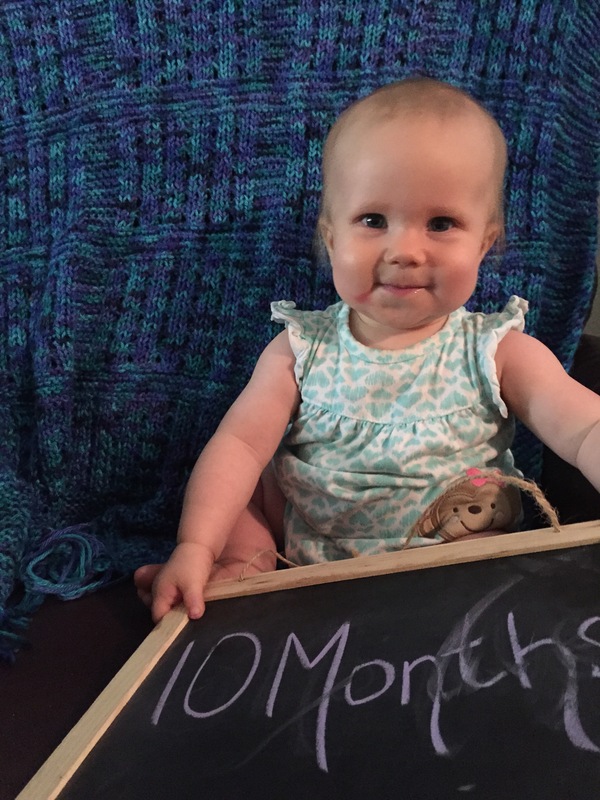 Annabelle Rose: Month 10 | Team Alzen! New foods this month: She eats everything but honey now, so no point in updating this list. Food is going really well. She LOVES quiche, watermelon, bananas, and avocado and prefers fats and proteins to fruits. She pretty much feeds herself at this point. The last few times I tried to feed her something pureed, she shoved her hand in her mouth after I took the spoon away, so we’re doing squeeze pouches for the remainder of the “baby” food in the house. Crawling is old hat these days. She’s pretty quick too! Pulling herself up on furniture is also very common now as it helps her reach for new wonders! She’s attempted a few tentative steps from standing position, but isn’t doing that too much yet. She thoroughly enjoys independently playing with her toys for a few hours throughout the day, which is very great for me. She also often says a-ba-ba. I’m also relatively certain that she recognizes her name and is trying to learn how to say it.